10 days ago I wrote about how Loganair and British Airways appeared to be playing a complex game of brinkmanship over a new codeshare agreement. Loganair operates flights to the Highlands and Islands of Scotland, primarily from Glasgow, Inverness and Edinburgh. It is probably best known for its service from Glasgow to Barra, where the plane lands on the beach and the flight times are adjusted to the tide table. Between 1993 and 2007, Loganair operated as a British Airways franchise. In 2007, it switched to being a Flybe franchise. It remained a British Airways codeshare partner, however, and because Flybe is a BA and avios.com partner you have been able to redeem Avios for these services. Loganair and Flybe are ending their franchise agreement on 1st September 2017. From that date flights will operate under the Loganair brand. When this news was first reported in November 2016, it was said that the British Airways codeshares would remain in place. Then things went very quiet …. With just two weeks to go – which means that the two airlines will already have lost out on some advance booking business – a new codeshare deal has been announced. It is worth noting that you cannot book these flights on a stand-alone basis with a BA flight number. They need to connect to another British Airways operated or coded flight. If you try to book Edinburgh to Sumburgh on ba.com, it tries to sell you Edinburgh – Heathrow, Heathrow – Aberdeen, Aberdeen – Sumburgh! As well as the obvious permutations, eg Heathrow to Inverness to Sumburgh, the codeshare should also allow routings such as New York JFK to Manchester (on AA, BA coded) to Norwich! You will earn Avios and British Airways tier points on the Loganair flights when booked under a British Airways code. Note that Loganair flights are Economy only. Unfortunately, you cannot redeem Avios on Loganair services, even those which have a British Airways flight number attached. Flights are already available for booking at ba.com. Might not be any fares loaded yet. Or ever. Try again in a few weeks, see if BA enter prices; even if there’s plenty of space, if BA puts a price on the route, no-one can buy it. Can’t seem to find any availability for LON – BRR. Am I missing something? May not all be loaded yet. I got Sumburgh to price ok last night. 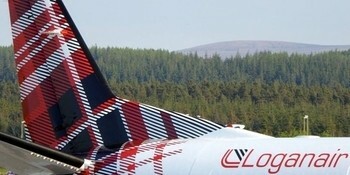 I hope there are no service enhancements once Loganair starts flying under its own colours – last time I flew with them to Shetland, we were served a cup of tea and a Tunnock’s Caramel Wafer. My booking says complimentary snack and drink! +1 booked with Logainair direct for Barra flight in Oct.
i used to fly the Norwich-manchester service weekly and when loganair took it over you started getting a coffee and a tunnocks wafer, I quite liked them! Living in Dundee and being 10 mins walk from the airport makes me yearn for the days when we could redeemed avios for the Flybe flight to London – I had my fingers crossed the codeshare might allow this, nevermind. Maybe Loganair will join avios.com? Thoughts anyone? I’m sure it has been discussed. I think Loganair will wait to see how the war with Flybe / Eastern pans out. Interesting, as a resident of NWI will ba.com start pricing options on Norwich to Heathrow, or even 2 stop options on the full BA network? Nothing on the BA app yet though. So it is not possible to book BA London -Glasgow – BRR using avios?